The bulletin Silver Silence/Golden Speech (illus., color and b/w, 136 pages) is a supplement to Torrent No. 2, released in May 2014. Silver Silence/Golden Speech contains transcripts of conversations realized by five groupings of artists from Hong Hong involved in I Think It Rains, part of Burger Collection’s exhibition and research platform realized in Hong Kong in the summer of 2013. It was put in place to make a certain number of the informal thoughts, ideas and conversations by some of the participants more manifest. Contributors of Silver Silence/Golden Speech: Choi Yan Chi, Philippe Charmes, Luke Ching Chin Wai, Lam Tung Pang, Law Man Lok, Anthony Leung Po Shan, Ng Ka Chun, Tozer Pak Sheung Chuen, Tang Siu Wa, Annie Wan Lai Kuen, Michelle Wong Wun Ting, Wong Wai Yim, and Francis Yu Wai Luen. In line with its release, Burger Collection will host The Spirit Wakes in the Night Wind, a discussion on art publishing during Asia Art Archive’s Open Platform on Friday, 16 May 2014, 4.30 – 6pm. The event will be held at Art Basel Hong Kong’s fair ground, at the booth of AAA’s Open Platform booth, P1, Hong Kong. This discussion round will look at the role and function of artist or artist-driven publications, both in print and online, at art criticism, and more generally at the function and present state of critical discursive platforms. Case studies and examples should be the starting points for the participants to debate the issues on the background of their individual projects and experiences within the HK art world and beyond. The event is organized around the publication of Burger Collectionʼs Torrent n°2, and its special Hong Kong supplement Silver Silence/Golden Speech, conversational meetings by Hong Kong artists and cultural practitioners. In its print version, Silver Silence/Golden Speech contains transcripts of conversations realized by five groupings of artists from Hong Hong involved in the exhibition and research project I Think It Rains. The conversations deal, amongst other, with the autonomy of artistic practice, ethics and morality in the visual arts field, and with cultural policy. Participants: Mary Chan (publisher and director MCCM Creations, Hong Kong), David Elliott (artistic director of the 2014 IVth Biennale of Young Art, Moscow), Hu Fang (fiction writer, co-founder and artistic director of Vitamin Creative Space Guangzhou and the Pavilion, Beijing), Charwei Tsai (publisher of Lovely Daze, Taipei), Yeung Yang (writer, curator, and executive director of soundpocket, Hong Kong), Oscar Ho Hing Kay (programme director of the M.A. 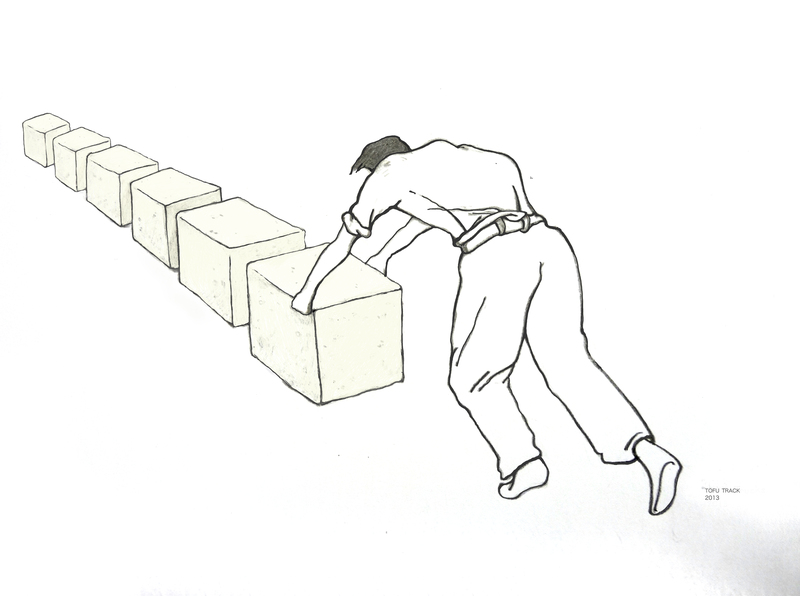 programme in cultural management at the Chinese University of Hong Kong and independent curator, Hong Kong). * The title of this session is borrowed from Wallace Stevens, Lettres dʼun soldat, I-IX, published in: Poetry, A Magazine of Verse, Vol. XII, No. II, 1918, pp. 59ff. 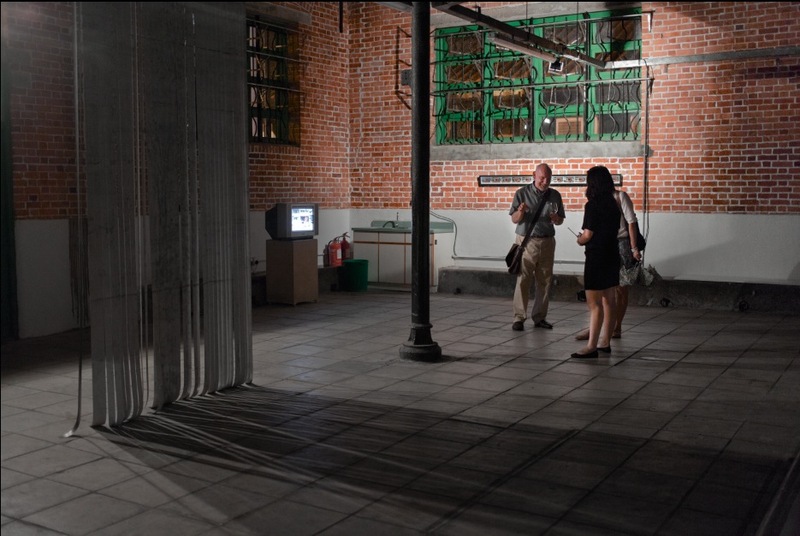 For more on I Think It Rains, including the Artist Shelves, source material by artists, and From Dusk Till Dawn, real-time activities of May 24, 2013, on Cattle Depot and offsite, see: http://www.ithinkitrains.org. Watch the recently published five minute documentary on the realization of Ng Ka Chun’s work Street Café. Street Café was a large scale mimic of a local street café. 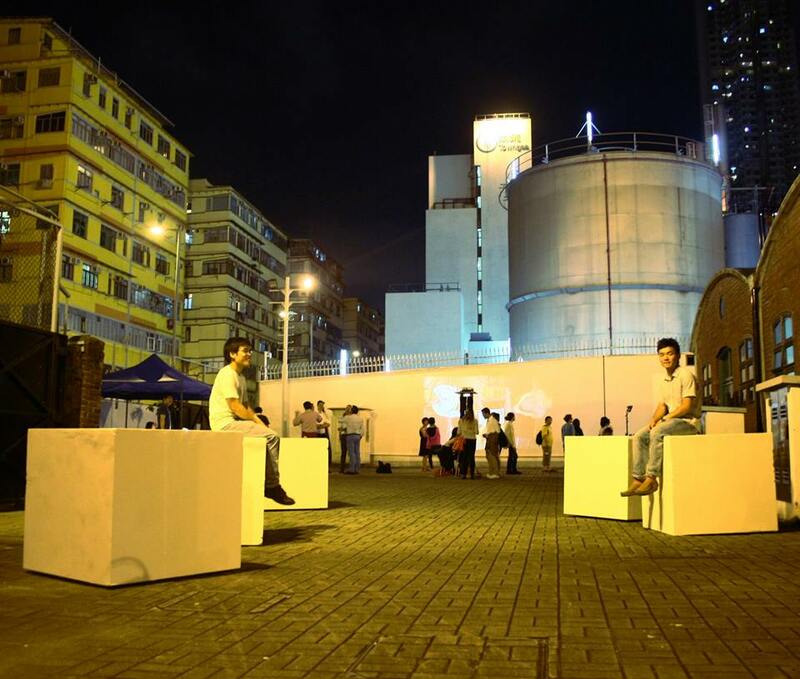 A temporary one-day installation, the work was produced by Burger Collection on the premises of the heritage site Cattle Depot Artist Village, Hong Kong, for the opening evening of I Think It Rains on May 20, 2013. I Think It Rains is an exhibition platform originating in a collaboration between Burger Collection and 1a space. 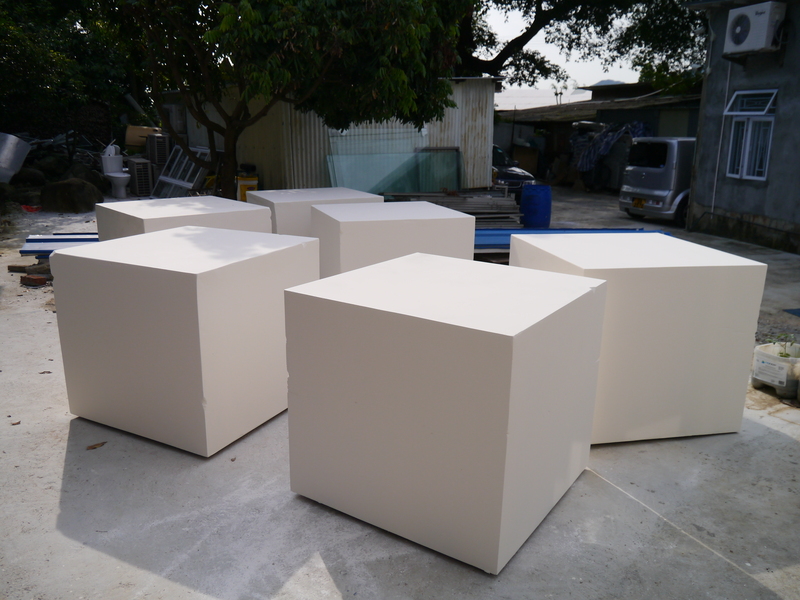 Part 1 took place at the Cattle Depot Artist Village in To Kwa Wan, Hong Kong from May 17 until June 30, 2013, and featured works by some thirty artists and writers from Hong Kong and abroad. Produced by Burger Collection, Hong Kong, 2013. 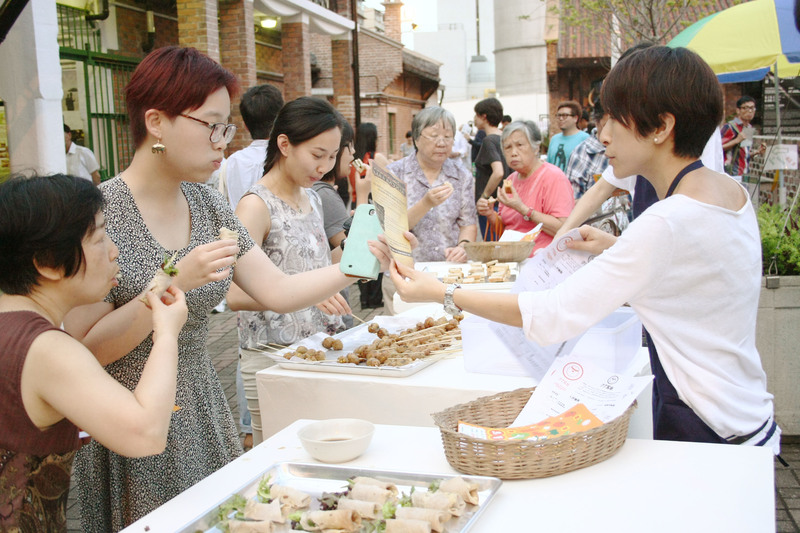 On the occasion of From Dusk Till Dawn, a full day of real-time activities held on May 24, 2013, Ng Ka Chun partnered up with local organic chef Sunny Chan to serve visiting guests a wholesome bite. 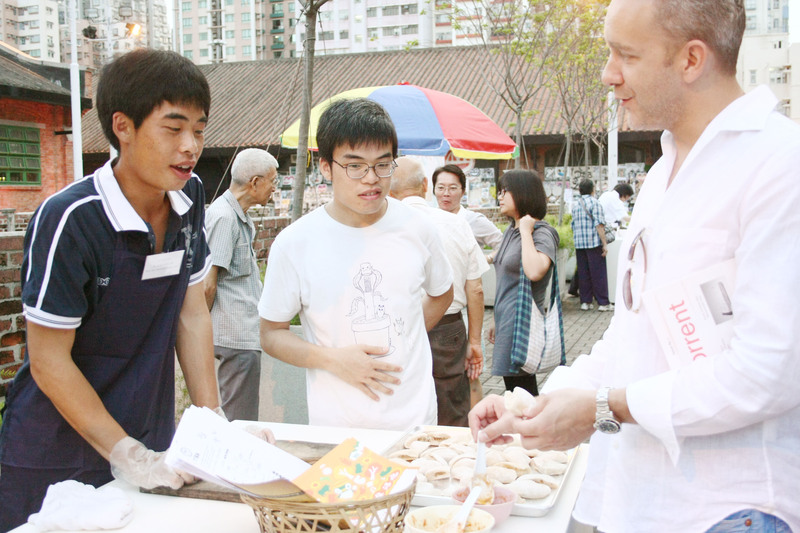 Six mobile stalls or ‘tofu trucks’ were set up, each stall serving a dish that contains tofu or a bean constituent. 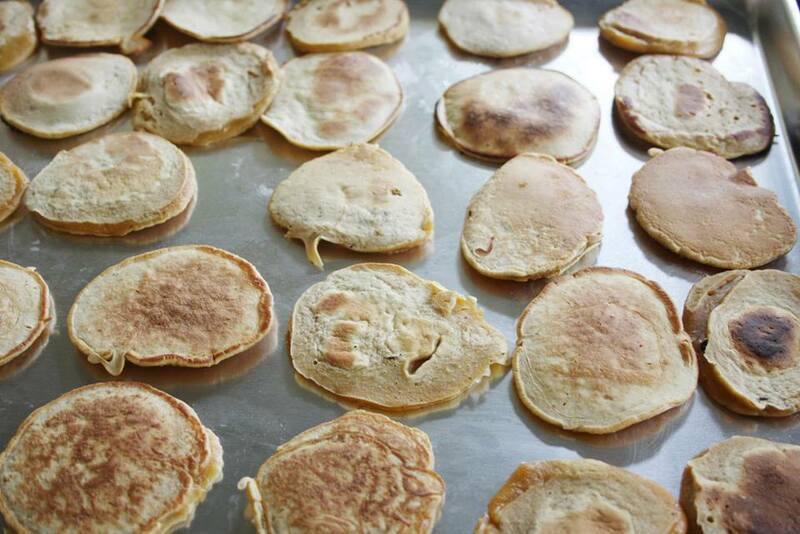 Their mission: to promote healthy eating and to support local organic produce. 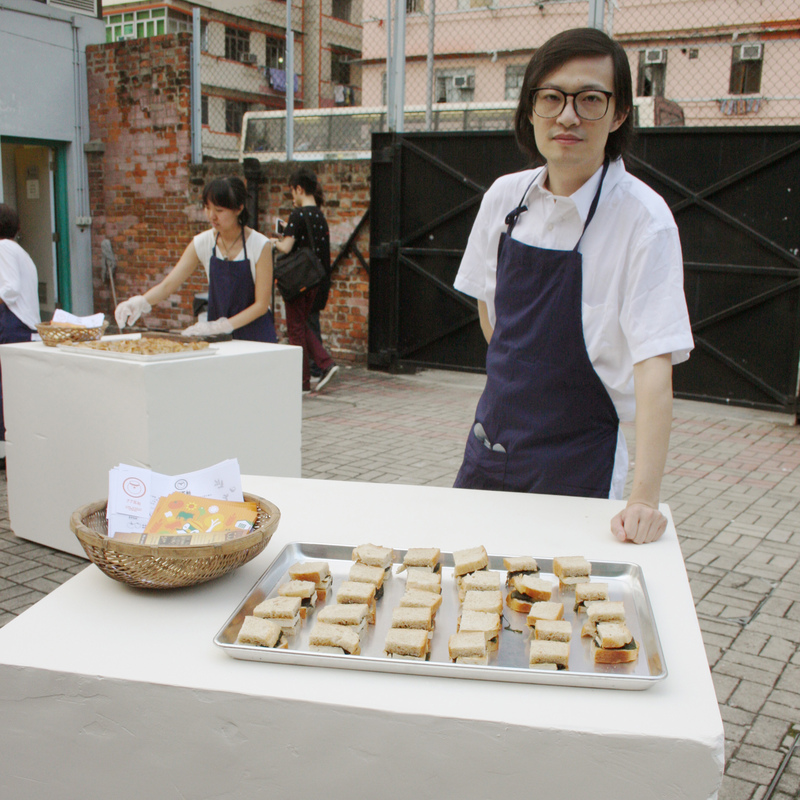 Sunny Chan makes his dishes out of tofu made from locally grown organic soy beans and brine, from the Mapopo Community Farm located in the New Territories, Hong Kong. Ng Ka Chun (b. 1985 Hong Kong) graduated from the Academy of Visual Arts, Hong Kong Baptist University in 2008. After graduating Ng built up his studio in Fo Tan. Chun is a core member of the community art space Woofer Ten in Hong Kong. Recent exhibitions include, amongst others: Fresh Vision, art@government Building, Sha Tin, Hong Kong (2012), Philosopher’s (knock-off) Stone: Turning Gold Into Plastic, Osage, Hong Kong (2012) and Exhibition under a breeze, Goethe-Institut, Art Centre Hong Kong (2012). His work has been exhibited in Australia, Shenzhen and galleries in Hong Kong. Sketch by Ng Ka Chun. Sunny Chan (left) and Ng Ka Chun (right). The ‘tofu trucks’ created in Ng Ka Chun’s studio in Fo Tan. Still frame of Disappearance of Victoria Harbour Skyline, 2013. 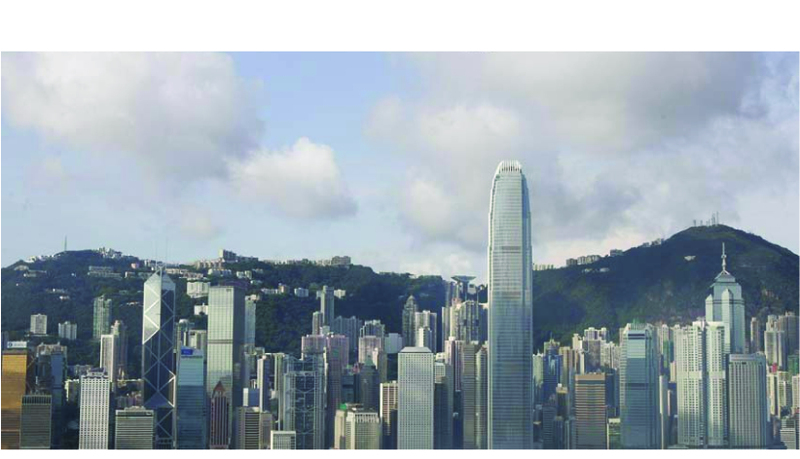 The Victoria Harbour Skyline is one of the most used city marketing images, showing Hong Kong as a globalized cosmopolitan city, and often portrayed in advertising with a panorama of the city’s skyscrapers. Artist Ng Ka Chun’s cardboard sculptures are in a sense a social satire of this by-now iconic imagery. 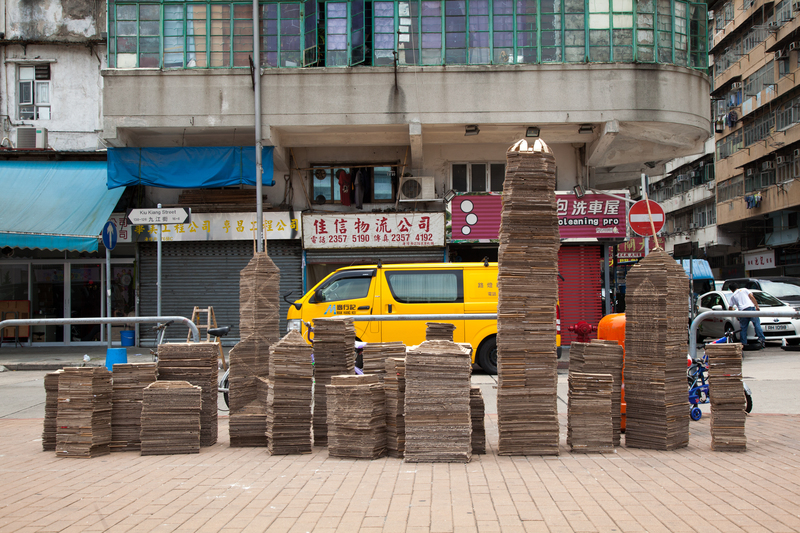 Cardboard, as a recyclable commodity, is commonly collected by the elderly in Hong Kong. With no proper welfare, the poverty amongst the elderly in Hong Kong is increasing, with statistics reporting that one in every three senior citizens lives below the national poverty line. 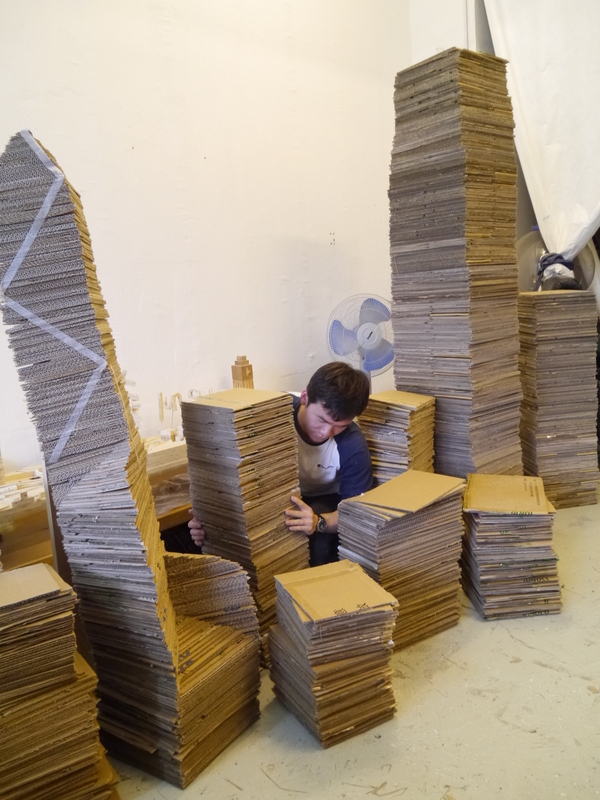 The skyline of Victoria Harbour, of which Ng Ka Chun, has recreated several of the monumental buildings into cardboard. The evolution of the scavenge of cardboard. Detail of Disappearance of Victoria Harbour Skyline. Click to enlarge image. Ng Ka Chun working in his studio. 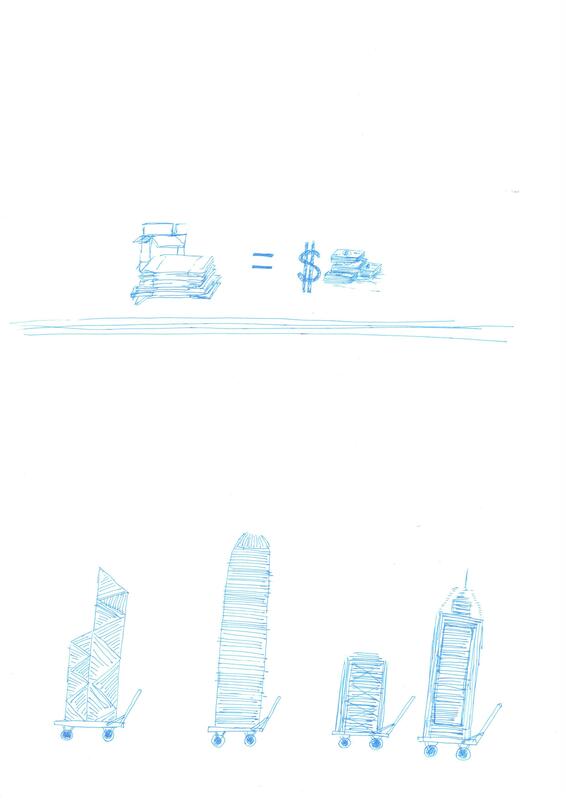 Sketch by Ng Ka Chun, 2013.